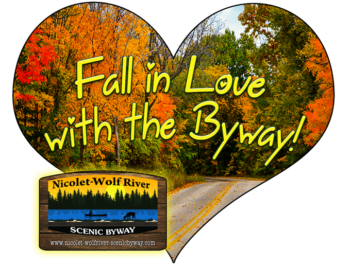 Nicolet-Wolf River Scenic Byway – Fall in Love With the Byway! 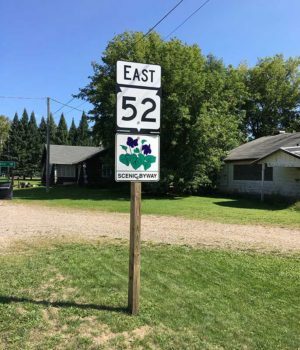 The Nicolet-Wolf River Scenic Byway is located in the heart of the majestic Chequamegon-Nicolet National Forest and home to the headwaters of the pristine, boulder-strewn Wolf River. Here you’ll discover communities where life moves at a slower pace and centers around time-honored traditions and values. Enjoy beautiful scenery dotted with majestic vistas, winding roads, and family owned businesses offering hometown hospitality. Experience the rich blend of culture with Native American Pow Wows, Polish Heritage Days, Kentuck Day and more. Hear the peaceful sounds of Northern wildlife - loons on a quiet morning waking with the early fog on the lake, barn owls calling in the quiet of a moonlit night, or the rustle of leaves as you and a white-tailed deer cross paths. Experience the amazing diversity of wildlife, trails and outdoor activities in the Chequamegon-Nicolet National Forest. Amid the relaxing atmosphere and peaceful scenery, you’ll find a unique blend of attractions: gaming, entertainment, food and shopping, trails and sports that make our area a favorite vacation destination for all ages. Fall in Love with the Byway and experience a sense of place, where the people and nature are authentic. The Byway is Beautiful in the Winter!